Students digging for irrigation on LMI grounds. The Summer Work Program at Liberia Mission is an annual employment opportunity for some of our sponsored high school students. We have different projects every summer which we hire students to do, giving them income and job experience while helping us beautify the campus. The money that the students earn helps them to purchase books and school supplies for the upcoming academic year. They also learn valuable, practical work skills in the process. All of the funding for the projects comes from the generosity of our sponsors. Students working on our cucumber crop. The students began the program this year with a general clean-up of the property. They organized piles of old tin roofing and did a LOT of brushing (Liberian term for cutting the grass). From there, some of the students began to clear and cultivate the land for planting new crops. Our goal is to drastically reduce money spent on produce at the local market by supplying our own fruits and vegetables through the agriculture program. By God's grace, we will cut costs while also teaching the students valuable farming skills. The St. Isidore Piggery, another vocational training program that teaches the students how to raise pigs and bring them to market, has also received some major renovations. 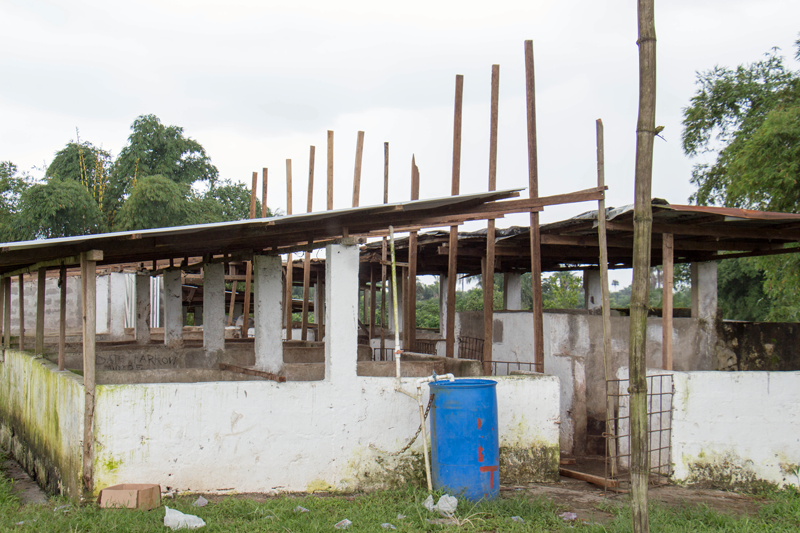 The roof has been repaired and extended, giving better, much-needed protection to the pigs during the heavy downpours experienced in the Liberian rainy season. The walls have also been repaired with cement, scrubbed, and painted, so that the piggery upholds the standard of cleanliness that it is well known for. This is St. Isadore's Piggery before its rennovations. Our capital work project this summer is the construction of new bathrooms for St. Anthony of Padua School. We have 450 students, 20 school workers and only 4 toilets. The current bathroom was built when we only had an elementary school. It has 2 toilets for the girls, 1 for the boys, and 1 for the teachers. One of our students at Booker Washington Institute drafted the plans for the new facility. The girls’ bathroom will have 7 toilets and 5 sinks; the boys’ bathroom will have 4 urinals, 3 toilets, and 5 sinks. There will also be running water throughout! The teachers will remain in the old bathroom, allowing the students to take full advantage of the new facilities. Our student Jacob is seen here drawing up blueprints for our bathroom construction project. He is studying drafting at Booker Washington Institute and gains practical experience through our summer work program. We are still in the foundation-digging phase, but we are moving along at a swift pace. The rain has been constant and heavy this July, and we have not been able to receive truckloads of river sand to mix with cement because the rivers are too high. We have not let this stop us, though! The students have been digging sand from our very own soccer field just so the work can go forward. Please pray that the rain lets up enough for us to receive the materials we need and to be able to work at a pace that will get the job done in time. Students working on the bathroom foundation. All of these projects and renovations would not be possible without the gifts of our donors. YOU make our vocational program possible and are directly impacting the lives of our student workers. We are so grateful. If you would like to support our summer work program, you can make a gift and note that it is for our work program in the "Gift Note" box. Thank you to each person who shares in our lives and makes the work of LMI a reality everyday.